StrongMinds is the only organization working to scale a model to treat depression throughout Africa — starting in Uganda. Our unique community-based model of group talk therapy is simple, innovative and cost-effective. In response to the depression crisis in Africa, StrongMinds conducted extensive research and analysis to identify the most appropriate treatment intervention that the team would initially use as it began to treat depressed women. StrongMinds ultimately selected Group Interpersonal Psychotherapy (IPT-G) as the core methodology, with plans to experiment and modify it over time as the organization developed on the ground expertise. IPT-G is a simple, proven and cost-efficient community-based model to treat depression that focuses on relationships among group members. Groups are led by a facilitator over a period of 12 weeks to help members identify the root causes and triggers of their depression, and formulate strategies to overcome those triggers. Since depression is episodic and recurrent throughout most people’s lives, these newly acquired skills have both immediate and a long-term preventive impacts for the sufferer. IPT-G was first tested in Uganda by Johns Hopkins University (JHU) in a randomized controlled trial in 2002. Using lay community workers with only a high school education, the researchers found IPT-G was remarkably successful, reducing the depressive symptoms of 93 percent of the 224 patients they treated. A separate group psychotherapy trial, in Africa in 2012 and again led by JHU researchers, was equally successful. The JHU research study in 2002 showed that positive effects of IPT-G continued for six months. In fact, some groups continued meeting for many years, maintaining greatly reduced depression levels among participants. For African women, who are afflicted at twice the rate of men, depression is the number one cause of disability. Since 2013, StrongMinds has been focused on creating a model that is effective in treating depression and easy to scale to reach the most women with depression in Africa. This drive has led to the creation of a model of intervention that is uniquely StrongMinds. Using Group Interpersonal Psychotherapy (IPT-G) as the foundation, StrongMinds has adapted and enriched this approach with specific role-playing activities and interactive visuals and charts. Each talk therapy group lasts 12 weeks, with the women coming together each week for approximately 90 minutes. Each session time varies due to the level of emotion being exhibited by the group members. Initial Phase: Group Sessions 1-4 This phase focuses on creating initial bonds between group members and building rapport with one another so women feel comfortable sharing personal information and discussing the reasons for their depression. Middle Phase: Group Sessions 5-9 This phase ensures that all members are actively engaged and helping each other by making suggestions regarding one another’s problems. This is also the phase where important progress is made for members to fully understand all the symptoms and triggers of depression. Termination Phase: Group Sessions 10-12 This phase focuses on preparing members to end formal sessions. Members are reminded to continually identify their own triggers of depression in the future and what they should do to respond. Individual action plans are created and reviewed. The StrongMinds model is achieving the same results as academic studies. Women who complete our talk therapy groups not only resolve their current depressive state — they also learn coping strategies to help prevent future depressive episodes. Roughly 75% of the groups continue to meet after formal sessions conclude. This continual connection allows the women to work through their depression triggers together as they arise. In addition, many groups form Village Saving and Loans Associations, which provide financial stability and allow the women to better provide for their families. The StrongMinds’ model is a unique intervention enriched with role-playing activities, interactive visuals, and charts. 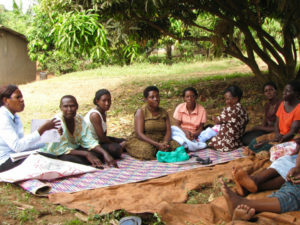 Group interventions are well suited for the African culture, given the strong presence of groups throughout its society. The StrongMinds talk therapy model is based on a 12-week period of 60-90 minute sessions. StrongMinds’ Mental Health Facilitators are not mental health experts, but local professionals who are trained and certified in StrongMinds’ psychotherapy model. Every 12 weeks a new cycle of StrongMinds Therapy Groups begin, each Mental Health Facilitator leads 10-12 groups per week, with an average of 12 women per group, treating 300-400 women per year. In addition, StrongMinds is working to empower women who have successfully completed a StrongMinds Therapy Group to run their own Peer Therapy Group. These women are selected and trained in an adapted StongMinds curriculum to become Peer Facilitators. Volunteers go on to lead their own Peer Therapy Groups within their communities. This model is an extremely low-cost way for StrongMinds to reach potentially millions of depressed African women in the years ahead. 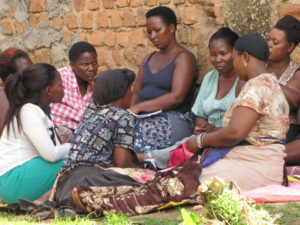 Once fully implemented on a large scale, StrongMinds will significantly impact the depression epidemic in Uganda and Africa because of the building capacity of local women to treat other for depression. In addition, StrongMinds is scaling by working with large International Non-Government Organizations. In the beginning of 2016, StrongMinds worked with the International Rescue Committee (IRC) to treat female refugees in Uganda. Later in 2016, StrongMinds began working with BRAC-Uganda to treat adolescent girls with depression. By leveraging partnerships, StrongMinds is able to reach more women with depression while making the work of the other organizations more effective because the women are able to function better. Our effective, efficient and scalable approach is critical. The goal of StrongMinds’ intervention is for the women treated to be Depression Free. Women who qualify for inclusion in our groups are evaluated via the Patient Health Questionnaire (PHQ-9), a depression diagnostic tool which contains a series of nine questions used for screening, diagnosing, monitoring and measuring the severity of depression. The PHQ-9 is administered again immediately following treatment, and again six months later, to determine the success of the intervention. If the woman’s evaluation indicates a score under a 5 on PHQ-9 after treatment, we have been successful. Scoring 1-4 is evaluated as Minimal Depression, and in lay terms this means that the individual is not able to be diagnosed with any significant level of depression, and is thus, Depression Free. Since StrongMinds’ talk therapy both reduces current symptoms and prevents future episodes of depression, we remain in contact with the women in order to measure the degree to which our intervention prevents future depressive episodes. In addition, StrongMinds measures the impact of our intervention on the overall well-being of the women and their families. During our pilot in 2014, we initially measured how the reduction of depressive symptoms impacted these women’s lives in such areas as employment status, savings and nutrition. We found strong evidence that reducing depression has a wide-ranging impact for the women and their families. 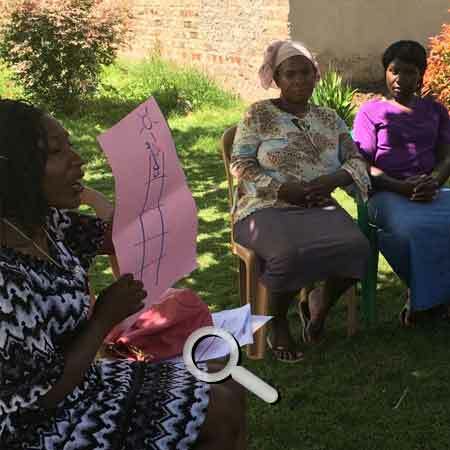 Presently, StrongMinds monitors and evaluates the overall well-being of the women it treats, and their families, on a regular basis to further its understanding of how managing depression for African women impacts them and their families. StrongMinds uses monitoring and evaluation to ensure that our method is the most effective intervention at treating women with depression and to improve its scalability so we can reach our goal of treating 2 million women with depression by 2025. Monitoring & Evaluation ensures our method of intervention is effective at ending depression. Below is the process a typical woman will go through to break the cycle of her depression by joining a StrongMinds Therapy Group to learn skills to manage her current depression and prevent future depressive episodes. The woman is often isolated in her home, struggling to function and care for her family. StrongMinds is frequently referred by a loved one, clergy member or community partner. Awareness events, such as information sessions, gain the community’s understanding and acceptance. She is screened for clinical depression by a StrongMinds Mental Health Facilitator twice before she is officially diagnosed and welcomed to a group. A one-on-one pre-group assessment discovers more about her unique trigger for depression. She joins 11-14 other women with depression to discuss their situations and learn from one another. The group is divided into three phases and based on group interpersonal psychotherapy (IPT-G) with additional interactive activities and visuals. These sessions focus on creating bonds between group members and building rapport with one another so women feel comfortable sharing triggers for their depression. During these sessions facilitators ensure that all members are actively engaged and helping each other by making suggestions regarding one another’s problems. Members begin to understand the symptoms and triggers of depression. These sessions prepare members to end formal sessions. Members are reminded to continually identify their own triggers of depression in the future and what they should do to respond. Individual action plans are created and reviewed. The woman is assessed at the conclusion of the StrongMindsTherapy Group to measure changes in her depression symptoms. Over 75% of groups will continue to meet regularly and often pursue their own microenterprise activities. The StrongMinds team returns once more to see how she has progressed. The evaluator once again assesses her mental health and her family’s well-being. For most women, depression symptoms decrease, and their ability to function greatly improves. With the family benefiting from additional income and support, her children are now able to attend school. There are fewer medical visits and more meals for the family. StrongMinds’ vision is to treat and improve the lives of 2 million women with depression by 2025. By enabling women who have successfully completed a StrongMinds Therapy Group to be trained to lead their own Peer Therapy Group, the impact multiplies.